Home / EBS News / EBS @ MusikMesse 2012. Pre-Show update! EBS @ MusikMesse 2012. Pre-Show update! Welcome to the EBS Blog, and the MusikMesse special! Here’s where we will post the daily news from the show next week, so subscribe to make sure you won’t miss anything! Already now, we’d like to present some of the happenings involving EBS at the show. 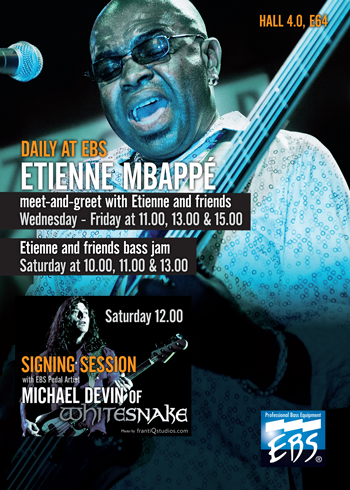 EBS Artist Etienne Mbappé will be our host at the booth with daily meet-and-greets on Wednesday, Thursday and Friday at 11, 13, and 15:00. Etienne is an incredible bass player that has been working with the likes of Ray Charles, Salif Keita, Joe Zawinul, Steps Ahead and not least his current gig with John McLaughlin! Etienne was also the bass player of last summers All Star Band to open the prestigeous Montreux Jazz Festival. A band that featured Carlos Santana, John McLaughlin and Dennis Chambers, to name a few. So, take the chance to meet this master on the bass at the EBS Booth, Hall 4.0, E64! On Saturday, when playing is allowed, Etienne Mbappé with friends will present jams at the booth at 10, 11, and 13:00h. On Saturday, there will also be a SIGNING at EBS with Whitesnake’s Michael Devin! Michael has brought his talent to the mighty Whitesnake showing what classic rock is all about since he joined the band. Come over and get the chance to meet him for real at EBS on Saturday at 12:00 h! Michael is an EBS Pedal Artist. There will be EBS at the main Agora Stage as well with Final Virus, featuring EBS Artist and German bass legend Peter Sonntag, as well as EBS Pedal Artist Reno Schnell on guitar! They will perform on Friday at 16 h and Saturday at 17 h.
EBS got nominated for a MIPA Award for ‘Best Bass Cabinet’ with EBS NeoLine 410! MIPA is described as the Music Industries Grammy Awards and the winners will be revealed on Thursday night, so that will be exiting too! And as promised, there will be new products announced at the show this year! So, stay tuned and come back for more in a few days! EBS @ NAMM 2012, VIDEOS! EBS @ MusikMesse 2012. DAY 1!